Have a constant supply of these cut up and stored in labelled containers (particularly the basic alphabet letters). The plastic coloured hardware ‘screw’ containers that attach to the wall are ideal. I have also seen them in plastic ‘bead’/ scrapbooking containers and in hanging plastic bags. Print off a couple of sets to laminate and glue magnetic tape on the back of each tile – great for fridge, whiteboard, and individual metal cookie tray word work. 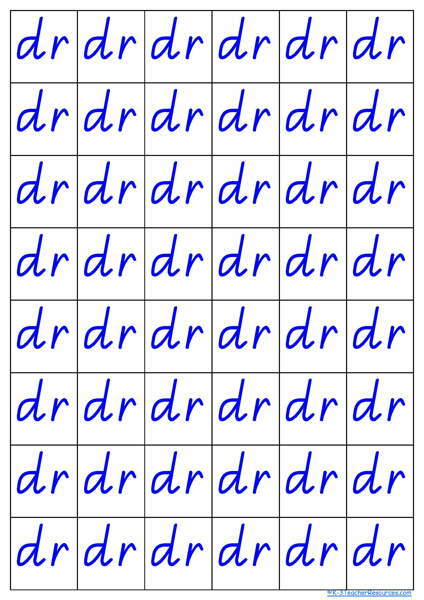 Just have the letters / graphemes out which you are focusing on at the time or depending on the level of your children – put out the whole lot…. One of my favourite activities is to set up a huge ongoing display where children can build words and glue them onto the display. This is great as part of language group time or even for early finishers or free time. Have word samples available from your theme words, sight words, or cvc (consonant vowel consonant) words. If you are just focusing on the alphabet letters – children use these to glue the letters in alphabetical order. Children match the upper case and lower case alphabet letters and glue them together, or place them together using the magnetic tiles. Children make up their own names using the letter tiles. Place a pile of letters in the middle of a group. Children take turns to throw the dice or spinner. Children pick up that number of letters out of the pile (they cannot choose the letters just pick randomly). This continues all the while – children are trying to use their letters to make up the winning words. First to make up these words wins. For older children, have a sentence written on the board for children to find the letters and glue into their language books. Glue a line of vowels into the children’s books. Children then have to write in the first and last letters to make up 3 letter (cvc) words. Use the printable alphabet letters to fill in a huge outline of an object beginning with that letter. For example, use the letter ‘a’ tiles to glue into and fill up a great big apple. Children could colour the letters in before they glue them on. Hi Ladies I’ve just downloaded the Capital Letters for the alphabet but noticed that they are sitting at the top of the space. Is it possible to have them moved down a little as i would like to put them on a ring so children can go thru them when learning their sounds. Could you send me an email if and when you have done this so i can download and print them off. Very Much appreciated. Is it possible for you to make a file that has one row of each of the tile files (upper, lower, vowel sounds, blends). For example the first page would contain a row of each a – h. I would like to use it for small group work and due to time and cost restraints of printing, laminating and backing with magnetic tape, printing out all of the pages is not feasible at the moment. Is this a possibility? Hi Naomi – Yes, I do understand what you mean – I will try an have this done for you by end of month Naomi. Hi Naomi, this is all done now – see number 7 download at the bottom of the page.